When you click out from CashKaro & shop, we get paid from KFC & we pass most of this money to you! Cashback is not applicable on purchases made on KFC Mobile App. To minimize risk of failed cashback, we recommend you to complete your sale in the same session after clicking out to the KFC website from this page. Click on Activate Cashback Button. Cashback under this offer is applicable thrice per month, per unique CashKaro and KFC accounts (Based on Email ID, IP address, Mobile no., Delivery address & Payment card/Wallet). Delivery charge of Rs 35 for all Orders. You will be redirected to KFC website. Buy 6pc Smoky Grilled & Get 3pc Free (50% Free Offer). This KFC Offer is valid for all users. This offer is valid on Friday only. Buy 4 Hot & Crispy with 4 of KFC's Signature Smoky Grilled at just Rs 449. Use the KFC Discount Coupon to get 10 pcs Hot Wings for Rs 250. Earn Flat Rs 30 CashKaro Cashback on orders over Rs 100. Use the KFC Discount Coupon to get Large Popcorn for Rs 150. Airtel Money: Flat 15% Cashback on orders over Rs 500. Max Discount Rs 150. Enjoy 10 Pcs Hot & Crispy Chicken Bucket at just Rs 500. Offer is valid on Wednesdays only. Use exclusive KFC offers today and save more on food ordering online. Buy KFC Hot Wings at Rs 125. Buy Triple Treat Box at Rs 649 via KFC. It has over 18,875 restaurants across 118 countries. In India, it is currently operating in Bangalore, Chennai, Delhi NCR, Hyderabad, Kolkata, Mumbai, Pune and Vishakhapatnam. You can download the KFC app to get added discounts and free home delivery on food orders. Fried chicken, burgers, rice bowls, snacks, beverages etc. How To Earn CashKaro Cashback At KFC? Great food at even better prices- sounds like a deal you can’t walk away from! Mouth-watering food just got cheaper which means you can now invite even more people to join and spread the happiness. Visit the KFC website which brings to you “finger licking good” food anytime, anywhere! You can get the best KFC deals on your favourite items ranging from Hot Wings to Grilled Chicken through KFC Coupons which allow you to save. To get these impressive offers all you need to do is visit CashKaro.com- India’s leading website which gives you the dual bonus of coupons as well as Cashback. Fall in love with the delicious chunk of chicken served in a soft sesame bun. With every bite you can dig into the goodness of the best-quality KFC chicken with salad and Thousand Island sauce. Grab this as a combo offer online through Nearbuy to save more. Customers who order non-veg meals onlince can make use of Nearbuy coupons to get discounts and offers on your KFC orders. The KFC special cold coffee a.k.a Kold Koffee is made of a rich blend of exquisite coffee beans, chocolate, milk, and cookie crumbles. Every sip of the thick and frosty cold drink is exotic and something you’ve never tasted before. The No.1 fully masaaledar snack from KFC has been India’s favorite fast food for a long time. Delve into the lip smacking taste of perfectly cooked chicken wings with a lemon chilli flavor to add more punch. Bite into the crispy KFC potato patty served with a soft and warm bun. Top it up with a tangy sauce and enjoy your evening snack with friends and family over the table. Get a taste blast midday with the indulgent and rich fruit Krushers made with the best strawberries picked with care. Grab along a burger or hot wings chicken to make a perfect meal. Beat the summer heat with a glass of cold KFC 7up Lime Soda. This is the all-time favorite of KFC food lovers. The lime soda goes hand-in-hand with chicken and burger. Save more on your orders with KFC offers and discount coupons. Find KFC stores near your place of residence with the use of store locator from the KFC India online site. There are top cities where many KFC stores can be found near you. The National Capital has a lot of KFC outlets in many places including Indira Gandhi Airport Domestic Terminal, Patel Nagar, Nehru Place, Lajpat Nagar, Ambience Mall, Dwarka, Connaught Place, and Kamla Nagar. The financial capital of India, Mumbai has KFC fast food chain outlets at Spice Court, Infinity Mall, Korum Mall, Viviana City, and Oberoi Mall. The capital city of TamilNadu has malls and meeting joints for a good snacking time. KFC stores are in ECR, Nungambakkam, T-Nagar, Chrompet, Velacherry, Express Avenue, Domestic Airport, Anna Nagar, and Mogappair. Kolkata has KFC outlets at popular joints and places in the city including Avani Mall, Park Street, Nicco Park, Salt Lake, and Shyam Bazar. Avail the latest KFC offers today online from KFC via CashKaro. You get discounts and additional cashback on every order. The Silicon Valley of India is a place where technology meets talent. There are a lot of hangout places in the city with fast food outlets from leading companies like KFC. The outlets are present in places like Phoenix Market City FC, Belgaum, J.P Nagar, Jayanagar, Electronic City, Hypercity, Bommasandra, and CMH Road. How to Get the Best KFC Deals? Search for KFC on search tab. Click on the first result in the drop-down list to land at the KFC store page. Choose one of the many latest KFC discount coupons and deals. Click on the ‘Grab Deal’ button to get the offer of your choice. You can buy KFC Gift Card from the KFC online store and from shopping sites such as Amazon India, Shopclues, and Woohoo. There are discount offers on gift cards from KFC and you can make use of it to grab the best deal. These offers let you order foods and drinks at the lowest prices online. KFC e-mail gift cards can be sent to the recipients of your choice by typing in the name and email of the recipient. The value of gift cards from KFC range from Rs 250 to Rs 2000. Pick the one of your choice and get a huge discount on your foods and drinks. Combine gift cards with KFC coupon code to save maximum on your food orders. Known for its tasty fried chicken, KFC came up with the ‘It’s Finger Lickin’ Good’ tagline in 1956. The American fast food chain is one of the most successful in the world with branches in over 120 countries. There are various snacks and fast foods from KFC including chicken, burgers, rice bowls, beverages, and more. You can order these from KFC retail stores and from the online site at discounted prices with the use of KFC coupons and discount codes. CashKaro.com has gained popularity over other coupon websites because it gives you hard cash back over and above coupons and discounts. That means when you shop via our website you get richer by saving more as you get cash over and above KFC coupon code with every purchase. Now doesn’t that make CashKaro.com a smarter choice to shop and save? KFC provides a host of mouth-watering food options and is always a preferred stop for chicken lovers! From their burgers to wraps to irresistible chicken buckets all their offerings are prepared with love making it finger licking good! They also have options for vegetarians including Paneer Zinger Burger with other equally yummy offerings. Alternatively, if you want to try out some yummy pizzas, check out pizza hut offers to get veg and non-veg pizzas at disounted prices. We just made their offerings even more tempting by giving you these Promo Coupons for your KFC orders! Grab your friends and celebrate the weekend by availing offers like 20% off on all orders above Rs 350 and Friday’s special 50% discount on the Fiery Grilled Chicken Bucket. 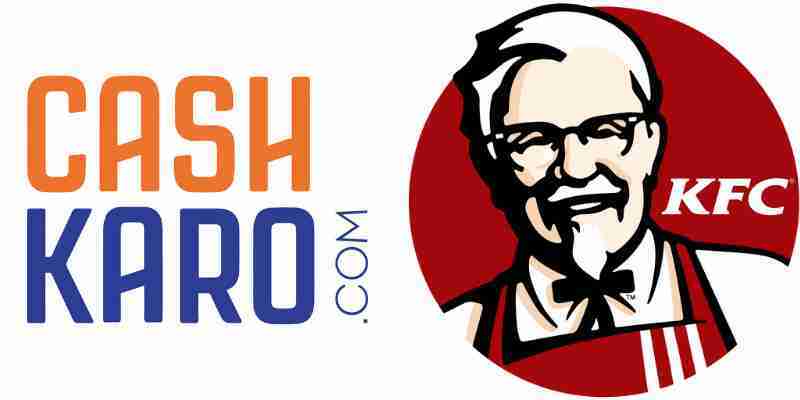 All you need to do is visit CashKaro.com and we will direct you to the KFC website to let you grab your majestic treats at jaw-dropping prices! Care for a more wholesome meal? Then try out Box8 coupons for the best prices on fresh, healthy, and tasty meals delivered in Mumbai and Bangalore. More deals and offers on foods are also available. The best part about placing orders online is that the delivery happens instantly. You can order meals even while you are on the go in trains with the use of TravelKhana=. They deliver to specific locations where your train stops for a few minutes. This is how you can get healthy and good food even while on your trip in trains. This is not all. You can find unbelievable offers on Dominos as well. Use Dominos offers for more saving! Visit CashKaro and browse for your favourite restaurant and we will give you the deals that you won’t be able to resist! How to Get KFC Coupons? Does KFC have Free Delivery? No. KFC does not have free delivery. It charges you a nominal delivery fee of Rs 35 on food and beverage orders. How to use KFC Gift Cards? Does KFC accept Sodexo Cards? No. Sodexo does not accept Sodexo Meal Card as a payment option.